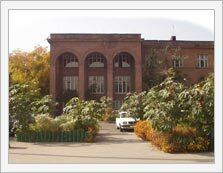 In the system of National Academy of Sciences of the Republic of Armenia the investigations in mechanics carried out in Department of Mathematics and Mechanics, in Department of Building Mechanics of the Institute of Building Materials and Structures (1945-1955), since 1955 in the Institute of Mathematics and Mechanics, and from 1971 to present time - in the Institute of Mechanics. The first systematic investigations in this area fulfilled for solution of torsion and bending problems of prismatic bars. During 1947-1948 the method reducing the solution of research problems to the regular infinite system of algebraic equations had been suggested by Nagush Kh. Arutunyan . On the basis of this method the problems of torsion and bending, widely used in mechanical engineering and construction of bars with different geometrical forms, were investigated. Since 1954 the multilateral investigations dedicated to study of plane, spatial, contact and mixed boundary value problems of elasticity theory, have been fulfilled. A numerous interesting problems of new class have been solved. During the construction of above mentioned problems' solutions, the mathematical methods of dual, triple-integral and other functional equations were generalized and developed. Significant number of works was dedicated to the problems of interaction of deformable bodies, as well as to different classes of stress concentrators (punches, holes, cracks, inclusions, elastic stringers).